If BMW’s engineers are going to fit a bike with big knobby tires, they should expect me to ride it off the beaten path. This machine – the Urban G/S – is the fifth iteration of the R nineT family, which speaks to the remarkable popularity of BMW’s Heritage line up: a market the company wasn’t even sure existed a few years ago when the initial R nineT was launched. But it does exist, and BMW’s Heritage bikes have been a remarkable success for the company, spawning a small family of offerings designed to appeal to nostalgic and hipster riders of all tastes. The Urban G/S does a pretty good job of resembling the ‘80s-era R80G/S right down to the fork gaiters and beak fender, the blue bands on the white tank, and of course that orangey-red seat. That’s a pretty legendary bike to emulate since the old G/S won the vaunted Paris-Dakar Rally in 1981, ’83, ’84 and ’85, not to mention serving as a predecessor to Motorrad’s wildly successful GS models. Make a bike look like a rally legend and fit it with off-road tires, and it seems to me like you’ve got the recipe for a go-anywhere, do-anything modern classic, right? 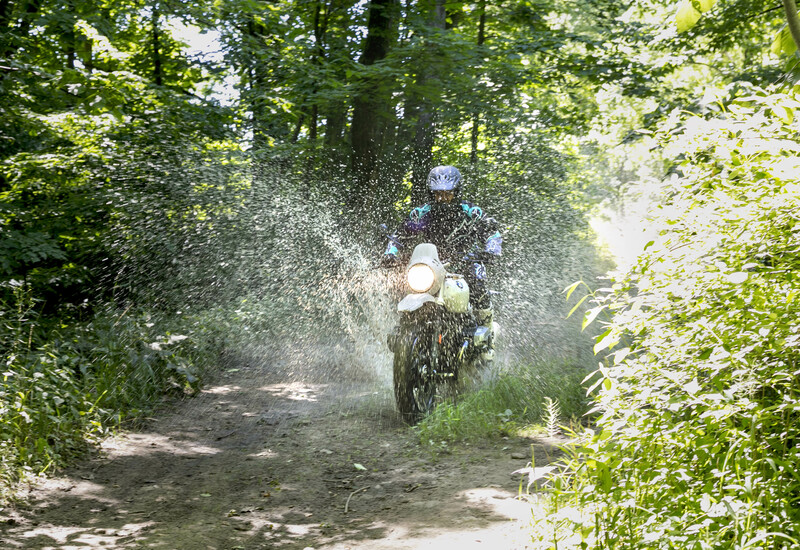 After riding CMG’s long-term R nineT Scrambler last year, it became clear that all R nineTs are fashion accessory bikes. This isn’t a terrible thing, if that’s what you’re after, but nobody should take the R nineT Racer to a track and expect it to perform like an S1000RR, nor should anyone campaign an Urban G/S in the modern Dakar Rally. That doesn’t mean the Urban G/S can’t venture into suburban, or, dare I say, even rural areas, and so I found a little gravel to ride on and it managed just fine. Then, I connected with a few buddies who have proper trail bikes, and followed them into the woods. Things got a little dicier, with the BMW bottoming out its suspension uncomfortably over roots and rocks. There is, after all, only 125 mm of suspension travel at the front, and 140 mm at the rear, which is not much for off-road duties. The Urban G/S is still very clean here, and looking a bit more Urban than G/S. But, as long as a slow and steady pace was maintained, the gnarliest of the R nineTs plodded its way along the single-track trail, through a few water holes, and out the other side of the forest at a farm that welcomes riders. The corn field has a winding dirt track through the middle of it, as does an adjacent grassy pasture that’s been mowed to allow for a nice green trail (should the dust prove too much in the corn field – and it was). There are even a few whoops and mulch piles plowed into jumps that others in my group were putting to good use to catch some impressive air. 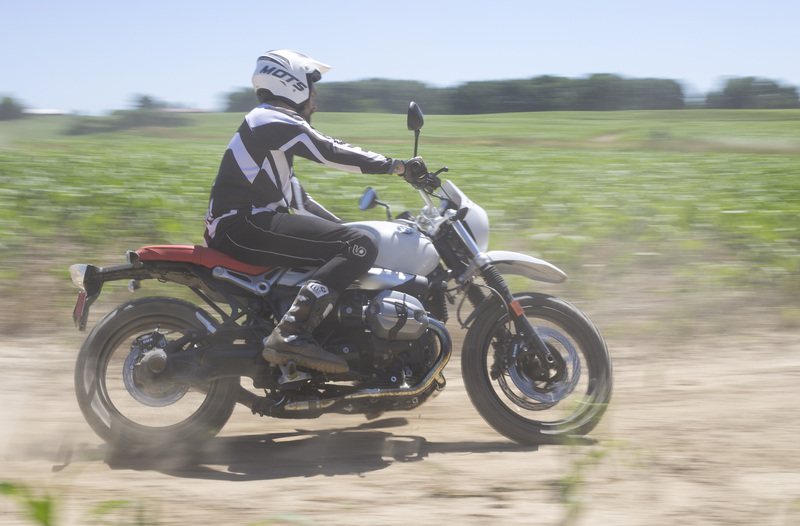 Neither the R nineT (nor me as its rider) were in any position to launch skyward, but we did have some fun tearing around the fields; something the street-oriented R nineT could not reasonably manage, nor even the street-tired Scrambler we had last year. Of course, if the Scrambler had been fitted with the same comically fat knobby tires (120/70 R 19 front and a 170/60 R 17 rear that looks like it’d be at home on an ATV), it would’ve done just as well off-road, since aside from cosmetic fixes, it’s exactly the same bike as the Urban G/S. Both have the same suspension set up and limited clearance, and of course, they’ve both got the 1,170 cc air-and-oil-cooled flat-twin engine that directs its power down the prop shaft. The abundance of torque (86 ft-lbs) afforded by the big boxer engine is readily available and easily doled out thanks to sublime fueling. This means managing the R nineT over undulating terrain is within reach of riders like me who tend to prefer the relative predictability of pavement. 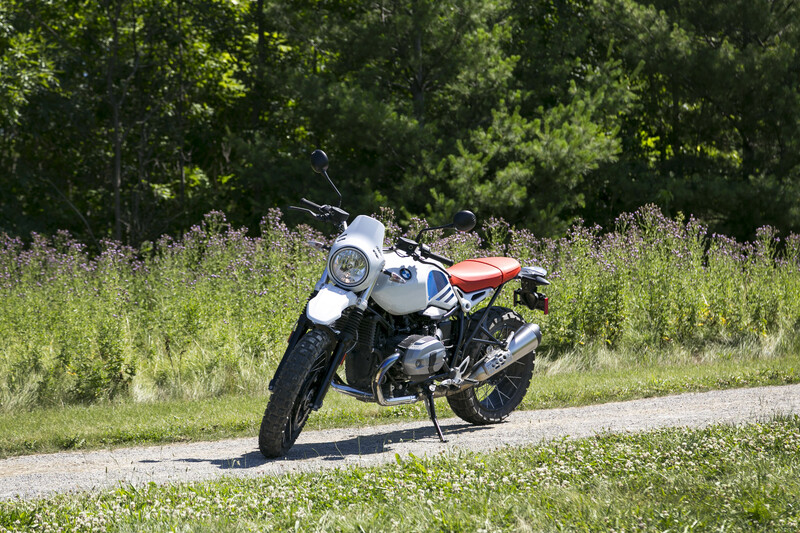 What’s more, the low seat height (BMW claims 33.5”, which is several inches lower than most off-road bikes, but two inches higher than a standard R nineT) and significant mass positioned quite low in the bike means horsing the Beemer around in the dirt with all that torque isn’t all that intimidating. BMW allows the ABS and TCS to be switched off with the flick of button on the left grip. Still, paying too much mind to the Urban G/S’s off-road capabilities is silly since (like most SUV buyers) most buyers are unlikely to consider it, let alone try it off road. For those who are curious, the R nineT won’t fall apart when the pavement ends, and if you’re at all serious about it, order the accessory hand guards, headlight grille and certainly the aluminum bash plate for the engine. Or better yet, just get a real GS. It gets dusty down Jeff’s way, as the Beemer’s air filter is discovering. On-road, the stuff I’ve always loved about the R nineT – its looks, its smooth ride and its capable handling – are all present in the Urban G/S, but each in reduced quantity. 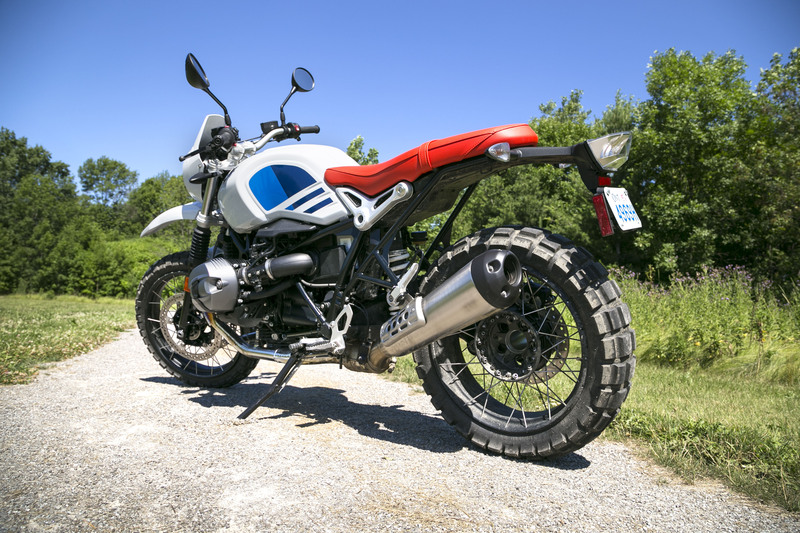 I get the significance of the Paris-Dakar-style livery, but on the lower, bulkier R nineT platform, it just looks like the classic GS bike’s shorter, fatter cousin. The smoothness of the engine is still there, but those knobby tires (which warranted a V-MAX 160 km/h sticker on the test bike) definitely cause the mirrors to bounce around, and a bunch of vibes to come up through the bars and even the rubber-covered pegs. And the squirming felt during harder cornering was a bit unsettling. Still, the suspension that had minimal give off-road is actually quite soft for on-road duty. For hard cornering, this would be an issue, but the tires preclude that anyway. The roads on my daily commute, however, have been brutalized by steel-hauling trucks, causing ruts and pot-holes that have been known to swallow Vespas whole. The Urban G/S was in its element there, and simply rocked over all of it without much concern. 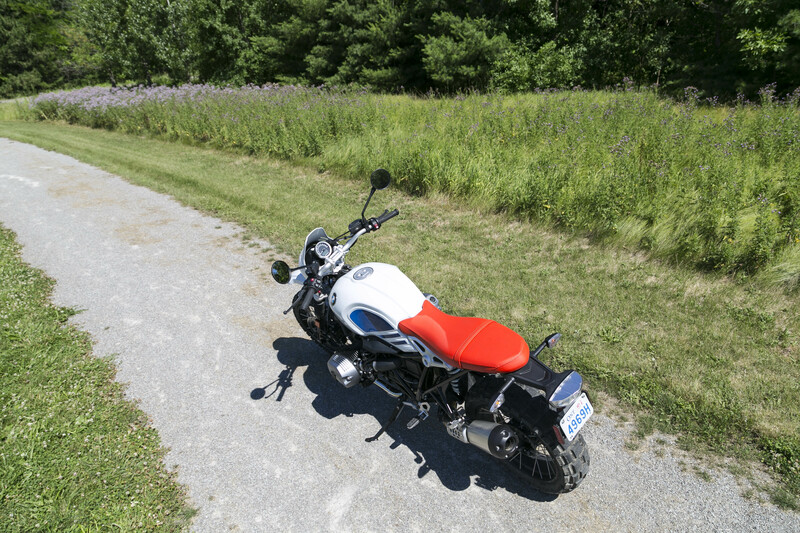 The seat appears to be a bit thicker than the one on last year’s Scrambler, and it proved to be sufficiently comfortable, even for an hour or more at a time on the highway. I also noticed that the Urban G/S sounds different than the last few R nineTs I’ve ridden. Where the original and Scrambler have their twin-outlet Akropovic cans, the Urban utilizes the single outlet found on the Racer and Pure models, and it sounds much better. Now it’s as if it has a bit more dirt bike braaaaaap, combined with the flatulence of Uncle Horst after an evening of beer and bratwursts (no, no, that’s a good thing). Whatever it is, it gives the boxer more aural character without being too loud. Cruising along at highway speeds, the combination of tire hum and the boxer thrum sounds like a little Cessna. 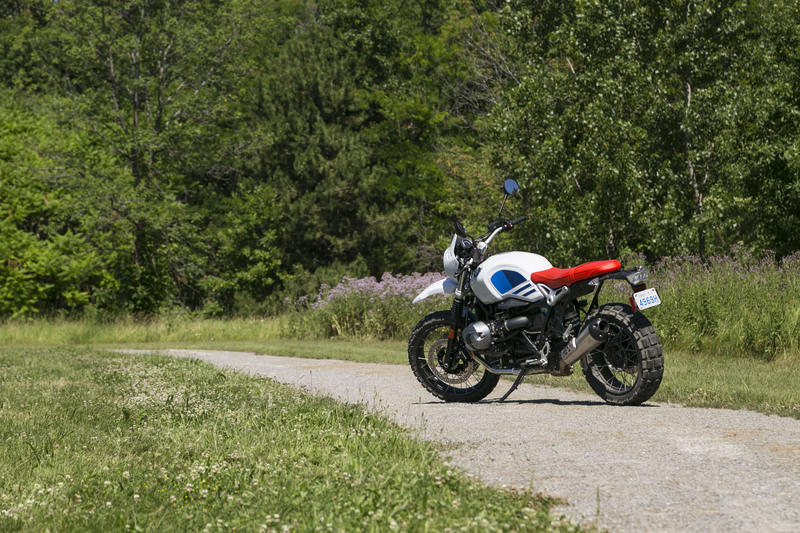 Not as hip as the Scrambler, and not as adventurous as an actual GS, the R nineT Urban G/S has found its niche on a nice gravel pathway. I’ve always admired the robust feel of the R nineT’s transmission. Gear changes occur after a solid, and deliberate action through the shifter, and pretty much negate the need for a gear indicator on the instrument panel. It doesn’t, however, make me any less annoyed that BMW sees fit to add heated grips, yet no damn tachometer or fuel gauge! The R nineT remains one of my all-time favourite bikes, but only when it’s not playing dress-up. I’d be quite happy to have a “regular” R nineT, or even a Pure model parked permanently in my garage, but I’d skip the compromised styling exercises of the other three variations. For those who are completely enamoured by the Urban G/S, skip the knobby tires and use it to bomb around town, unless your favourite moustache wax store or hipster coffee shop is located off the beaten path. In that case, spec the knobbies and have at ’er. A bike that’s out standing in its field. 169.5 kg wet weight? Not likely. Try 221 kg. wet weight. So basically, as I suspected, it’s just a styling exercise. Which is fine if that’s what you’re after, but I’m more of a “form follows function” guy. Agreed. I picked up a ‘14 KLR this year and I don’t believe you can get more form follows function than that. And I’m not sure how 110hp with knobbies would benefit any situation. Well, except for making a wicked roost.